Carefully worded diplomatic language following high-level Russia/US meetings conceal intractable positions on resolving conflicts in Syria and Ukraine. Things are no closer now than earlier, regardless of public pronouncements. Washington wants its imperial agenda proceeding unobstructed, war its principle strategy of choice. 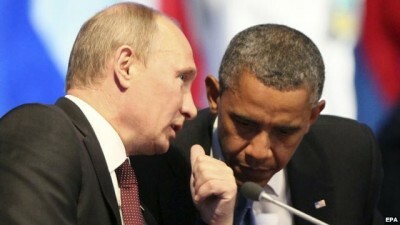 Years of Russia/US talks proved futile. Expect nothing different this time whatever is announced ahead. Putin’s spokesman Dmitry Peskov said his Monday meeting with Obama “lasted longer than planned,” discussions focusing mainly on Syria and Ukraine, resolving nothing. “(W)ork will continue,” Peskov explained, perhaps interminably, irreconcilable positions making resolution unattainable. When leaders, other officials or their spokespersons say talks were constructive or fruitful, they mean major unresolved issues remain. He expressed “grounds to believe” agreement may be reached “within the next few days,” with no further elaboration or acknowledgement that all US agreed on deals aren’t worth the paper they’re written on, systematically breached at Washington’s discretion, at times straightaway. Obama didn’t wage war on Syria, or any other country he attacked, to quit. The record is clear. All US post-9/11 wars continue endlessly with no prospect for resolution anywhere. How when he initiated it? How with America supporting ISIS and other terrorist groups, not combating them? How when Washington considers defenseless civilians legitimate targets, slaughtering them with disturbing regularity? How with US warplanes bombing Syrian infrastructure and government targets, not terrorists as claimed? How with CIA operatives and US special forces directing ISIS and other terrorist groups against Syria’s military and civilian population? How with America blocking humanitarian aid for desperately needy people? How when peace and stability defeat its agenda? Endless wars of aggression and chaos serve it. Putin saying he and Obama “reached mutual understanding” fails to acknowledge the futility of dealing with a duplicitous partner. He knows the obstacles he faces, notably longstanding US plans for regime change in Russia and all other sovereign independent countries – why global war with nuclear weapons is humanity’s greatest risk if Hillary succeeds Obama.